Edible Flowers | 5 Flowers You Can Eat! Looking for Edible Flowers? Experiment with the tastes and texture edible flowers have to offer. Here is the complete list of edible flowers and how you can incorporate them in your own recipes. The Complete List Of Flowers You Can Eat! Pansies are normally used to decorate pastries, garnish cocktails, soups, and even lemonade. They can taste grassy, to tangy or wintergreen depending on how they’re planted. Isn’t this pansy cake delightful? This is a salad show stopper for having a bright color (red, orange, yellow) which you couldn’t possibly ignore. Also, Nasturtiums are commonly known as edible watercresses, they have a peppery taste that will put a kick into your salad. Viola tricolor or heartsease may be served raw or cooked. Their leaves can be used in thickening a soup and the flowers for garnishing. Aside from being an edible flower, they are also considered a medicinal herb. How amazing do these spring rolls look? Learn to make them yourself HERE. These bright yellow dandelions are something you’ll be looking forward to on your next neighborhood walk! Dandelions are the perfect edible flower, because you can eat the whole thing from the root to the flower. This natural beauty is perfect for garnishing a salad. Their seeds can be roasted and used as an alternative for coffee. You can even make a dandelion wine. The dandelion is not just an edible flower, it is also rich in antioxidants and vitamins! Click here for 16 more Dandelion Recipes. Elderflower can be turned into an elixir, a tonic, and most commonly a liqueur. For this example elderflower has been whipped up into a delightful strawberry lemon chiffon cake! Get the recipe here at HonestlyYUM. This delicate white flower isn’t just good for cooking, it’s also great for your drinks. See how you can make this Angelica Infused Gin & Tonic here. You may be used to having arugula on your salad but have ever considered adding its flowers? Get recipes on how you can try it here. Growing basil is easy so take advantage of your labor by adding basil flowers to some of your dishes. Try this Spiced apple & peach tarte tatin recipe. ingredient for tea but also great with this Orange Panna Cotta. 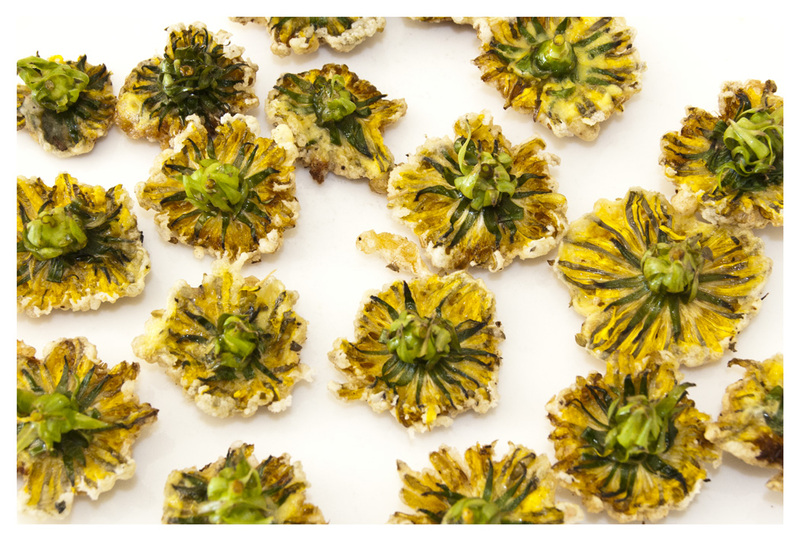 Ever tried turning borage flowers into candied treats? Well now you can with this Almond Fairy Cakes with Candied Borage Flowers recipe. This flower has been used in cooking for centuries. They’re commonly used in German soups and stews but why not make a change and use it for this Shortbread Cookie recipe instead? Commonly used to make herb infusions due to its medicinal benefits. Try it for dessert too with this Chamomile and Caramelized Honey Macarons recipe. This lacy white flower not only attracts beneficial insects but is also a great addition to some dishes. Try it by making this Roasted Halibut with Chervil Sauce. You use chives on a lot of recipes but don’t let its flowers go to waste. Try this Avocado Appetizer with Yogurt, Garlic, Micro Greens and Chive Flower that’s not just yummy but also visually appealing. If you like the smell, you’ll love the taste too. Try brewing your own Chrysanthemum tea by following this recipe. They may look like weeds but trust me, this is something you should try for your next recipe. See for yourself by making this White Clover Pudding. This beautiful flower is also called Bachelor’s button. The taste is slightly sweet to spicy and commonly used for garnish. Just see how it brings color to this Cornflower Glaze. Did you know that the flowers have more flavor than the seeds? They don’t last long once picked to be sure to use them right away. Try it with this Summer Corn & Tomato Salad with Dill Flowers. A beautiful flower that’s easy for the picking. Try it as Daisy Capers. Garlic flower has a more delicate flavor than the bulb itself. It’s best eaten raw so it works best on this Pesto Flower Garlic and Roasted Almonds Recipe. Charming and impressive. These 9-feet flower stalks are great for garnish and perfect for making this Flower Jelly too. The sweet nectar of life. If you love ice cream, you’ll love this Honeysuckle Ice Cream recipe. So beautiful and fragrant. Eating lavender brings so many benefits. You can even eat it in the form of this Salted Honey Lavender Pie. Enjoy! Honey Lavender is also a new popular ice cream flavor! If you’re ever in Los Angeles or Portland you must try Salt & Straw’s version. This can easily be your favorite flower. They’ve always meant to me as the beginning of summer so what better way to celebrate the season than to make a Lilac Cream Cake. Familiar and bright. Add color to your dish by putting a couple of petals as garnish. Also try it on this Egg and Tomato Salad with Marigold & Chive Flowers. Ever tried blue tea? Well grab some butterfly pea flowers and make your homemade tea with this recipe. A cheery flower most gardeners keep indoors. Harvest some and make your very own Primrose Curd. You love using rosemary leaves as an herb but rosemary flowers also have so much potential for decoration and garnish! Try it with this Pumpkin and Red Onion Soup with Thyme and Rosemary Flowers. Usually, the seeds are cultivated for vegetable oil but you can also make use of the flowers. Try this Safflower Madeleines recipe. This purplish-blue flowers have a couple of uses: decoration for cake, herbed vinegar, tea or even this Buffalo Mozzarella with Sage Flowers, Smoked Salt and Toasted Walnuts. They may look fancy but believe me you can use them for a number of recipes. It can even be as simple as frying them or try making this Linguine with Nutmeg, Cream and Squash Blossoms. You love the seeds, you’ll love the flowers too. Try this Sunflower, Orange and White Chocolate Scones with Salted Honey Butter. Isn’t it wonderful that there are flowers that are truly edible? Be bold and try them on your next dish! You may find it unusual at first, but you’ll learn to love the flowers of the field, and enjoy their exciting summer charm! The rule of thumb for edible flowers is – if you can safely eat the plant, then you can safely eat the flower! Please note – only serve edible flowers that are organic. Never use commercially grown flowers, in the case of fertilizers or pesticides that are harmful to our body. We hope that this has inspired you to get experimental in your kitchen. Let us know in the comments section below what you thought of this edible flowers and on how this blog saves you from your kitchen nightmare! Which edible flower recipe are you going to try? Let us know below in the comments!